It has been written that great events turn on small hinges, and the same principle often applies to cricket matches. For four days the balance swung from one side to the other, turning all the time on minor events that gave one team and then the other a slight advantage. 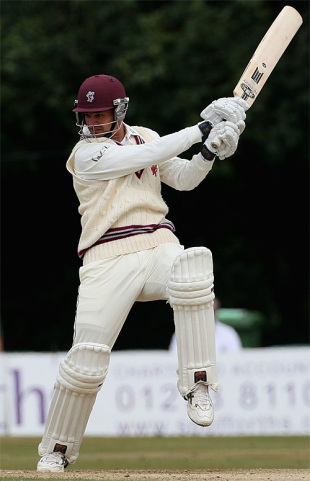 Marcus Trescothick, facing the second ball of the final day, from Matthew Hoggard, fenced at it and came within a whisker of edging it to the keeper. Had he done so, Yorkshire rather than Somerset would probably have taken the spoils. But that was only one of many little turning points in this intriguing match. Trescothick's innings of 78 laid the foundation for Somerset's four-wicket victory, while Zander de Bruyn's unbeaten 70 completed the job. Yorkshire fought tooth and nail, but for them the crucial damage had been done earlier in the match, when their batsmen twice sold themselves short against a threadbare bowling attack. Both teams began the day in deadly earnest, desperate for a first victory of the season. The former international pair of Trescothick and Justin Langer were intent on wearing down the Yorkshire bowling, which had Ajmal Shahzad given the honour of opening alongside Hoggard. He took a while to settle, but then did a good tight job. Runs came slowly, with Trescothick occasionally opening his shoulders to drive a handsome boundary, mainly on the off side. After nearly an hour the left-arm spinner David Wainwright came on to bowl, having been off the field for part of the previous evening after splitting the webbing on his bowling hand. Despite his handicap, he soon achieved the breakthrough. Trescothick, after his lucky break at the start of the innings, now suffered the ill luck of a freak dismissal: missing a sweep at Wainwright, he found the ball lobbing high off his pad but flicking his bat in his follow-through before being caught by the keeper. This was now Jonathan Bairstow, a capable keeper in his own right, as the regular, Gerard Brophy, was off the field with a hand injury. This was a vital breakthrough for Yorkshire, and they nearly got Langer immediately afterwards, as he skied a lofted on-drive and Shahzad, running back, failed to hold a very difficult chance. But the new batsman James Hildreth drove uppishly to be caught at mid-on, and Somerset were 139 for 3. de Bruyn joined Langer, batting well from the start, and the scoring rate began to improve. de Bruyn had 14 when he gave a very hard chance to Joe Sayers at first slip, which the fielder just managed to touch, but hurt his finger in the process. Langer's was the most vital wicket, and not long before lunch Yorkshire had it, as he followed a ball from Rana Naved that moved away just outside the off stump and Bairstow had another catch. Craig Kieswetter, who had done so well in the first innings, enjoyed two slices of luck within a few minutes, first nearly running himself out and then finding himself almost bowled by a fine ball from Wainwright on the stroke of lunch. After the break he dominated a brisk and useful stand with de Bruyn, at one point pulling him for six. At 25, though, he was given out caught behind as Bairstow juggled the chance and the batsman was clearly unhappy. This, at 221 for 5, was another potential turning point, as de Bruyn and Trego retreated into their shells for several overs against good bowling from Wainwright and Tim Bresnan. de Bruyn broke the spell with a big six off Wainwright over long on, and Peter Trego took a leaf out of his book with a pulled six and a straight drive for four off successive balls. de Bruyn, on 48, survived a very close appeal for lbw against Bresnan before pumping the next ball through the covers for four to reach his invaluable 50 off 79 balls. Yorkshire took the second new ball at 260 for 5, their last throw of the dice as the partnership appeared to be taking Somerset home. de Bruyn nicked Hoggard's third delivery involuntarily past the slips for four, an indication perhaps that the final turn in the match was to be in favour of the visitors. Trego finished his innings of 23 aggressively, hammering Shahzad for a powerful straight four before edging him to the keeper, but the momentum was now irreversible. The two South Africans, de Bruyn and Alfonso Thomas, knocked off the remaining runs with power and confidence, and Somerset finally completed a hard-fought victory. Yorkshire were perhaps slightly the better team of the two, and if there is to be blame for their defeat, it should be levelled at their batsmen, who in both innings sold themselves short and did not leave their bowlers enough runs to play with on a pitch that stayed good until the end. Bairstow, the best of them, should keep his place, but there are others in the team who may benefit from a warning that they need to produce the goods.